Your application is not complete, please scroll and make changes marked in red and then click 'Submit Registration' again. Thank you for your support of the College of Licensed Practical Nurses of Alberta 2019 AGM & Conference. The 2019 CLPNA AGM and Conference theme The Alchemy of Professionalism examines the elements of nursing professionalism, with experts from a regulatory, legal, clinical, research and patient safety perspective. Join us on this journey of transformation with opportunity to consider your own professional alchemy. The Alchemy of Professionalism refines the perfect combination of knowledge, skills and attitude to inform nursing practice. In the journey from student to professional nurse, competence and wisdom are gained along the way. Ethical decision-making combined with the ability to creatively manage complex nursing practice are required skills for today's nurse. This year's event provides a new approach to conference with dynamic and interesting keynotes, new abstract sessions and a condensed program. Arrangements for in-kind sponsorship can be made by contacting [email protected]. • Prominent visibility as Platinum Sponsor on screens and select signage on-site at the event. • Organization logo and link will be located on the conference website, conference app, and on conference promotional emails, sized and positioned according to level. • Opportunity to place one (1) pop-up banner in the registration foyer or plenary room (banners to be provided by the sponsor). • Four (4) complimentary conference registrations (includes Awards Dinner tickets). • Opportunity to provide content for one (1) push notifications that will be sent to all conference attendees via the conference app. • Verbal acknowledgement from the main stage throughout the event. • Opportunity to provide content for two (2) sponsored posts for the conference app. • Podium time to address delegates. 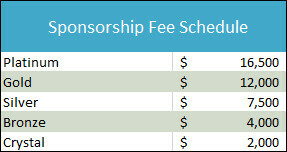 • Opportunity to be a named sponsor of one of the following: Awards Dinner, Breakfast x 1, Lunch x 2. *Includes the distribution of a promotional item and podium time during the sponsored event. • One (1) full page ad and one (1) half page ad in CARE Magazine. • Organization logo will be included in the conference article featured in CARE Magazine, sized and positioned according to level. • The CLPNA will acknowledge your support via an individual post on its social media channels. • Opportunity to use the CLPNA logo to highlight your support in your own promotions (use of CLPNA logo to be reviewed by CLPNA prior to distribution). • Opportunity to donate door prizes. • Prominent visibility as Gold Sponsor on screens and select signage on-site at the event. • Organization logo and link will be located on the conference website, social media, conference app, and on conference promotional emails, sized and positioned according to level. • Opportunity to provide content for one (1) push notification that will be sent to all conference attendees via the conference app. • Opportunity to provide content for one (1) sponsored post for the conference app. • One (1) half page ad in CARE Magazine. • The CLPNA will acknowledge your support via an individual post on their social media channels. • Prime visibility as Silver Sponsor on screens and select signage on-site at the event. • Opportunity to develop one (1) sponsored post for the conference app. • Organization will be provided with two (2) complimentary 30-day job postings on the CLPNA website OR one (1) quarter page ad in CARE Magazine. • The CLPNA will acknowledge your support on their social media channels. • Prime visibility as Bronze Sponsor on screens and select signage on-site at the event. • Visibility as a Crystal Sponsor on screens and select signage on-site at the event. Please upload your organization's logo for use on the website. We will be in touch to arrange transfer of a high-resolution image for print use. Uploaded image files must not exceed 1 MB, but may be emailed to [email protected] after completing this form. Thank you for completing the 2019 CLPNA Sponsor Application. An invoice will be sent to you via the College of Licensed Practical Nurses of Alberta after submission, at which point payment can be made directly to them. Once your form is submitted, you will receive a confirmation email. CLPNA will be sending your invoice, which should be submitted to your finance department for payment. If you have any questions, please contact CLPNA Convention Secretariat at 780-436-0983 x 229 or [email protected].